Well no surprises here, it’s raining in Ketchikan. The Mother Goose fleet is planning an 8am departure. The wind is forecast to be 15-20 knots and we expect a nice but bumpy ride. Three of the six boats are stabilized (including ours! ), but the other three will experience some rolling motion today. As we worked our way south, we saw very little traffic once we left the Ketchikan area. No pleasure boats were to be found, and only the occasional fisherman was spotted. We saw a couple of tugs with their tows, but all in all it was a trip devoid of ships and wildlife. 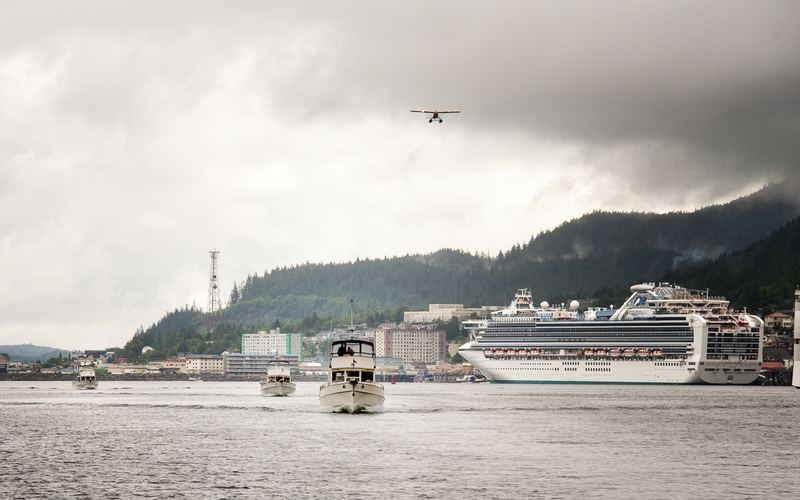 Cruise Ships and Float Planes? It must be Ketchikan! The rain was on and off again all day. Not really a factor in our travels. Once we arrived at Foggy Bay, Deception made fast a stern tie and then called each boat in turn until all were rafted. The two outside 49’s were each rigged with a stern tie to shore and their anchors were carried out and dropped by Captain Rich and Jordan using the dinghy. While successful, it became difficult for the little 9.9 hp Honda outboard to pull it’s load as more and more chain was paid out. The target was 200 feet of rode, but at about 150 feet Rich and the Honda both decided that it was time to set the 100lb. anchor. Shortly thereafter, we launched the dinghy for an excursion up Very Inlet in hopes of seeing some black bear and anything else that caught our fancy. The rain would come and go, and with it our interest in staying out too long. We did manage to travel a few miles up to the first rapids. They were running too strong on our bow to warrant an attempt at running them. So a quick about face, and we returned to Alaskan Dream with the cold mist in our faces. After shedding the foul weather gear, I finished up making some dip for a little planned socialization onboard Deception. Every boat brought a little snack or appetizer and whatever was their pleasure to drink. We spent a nice time getting to know one another. 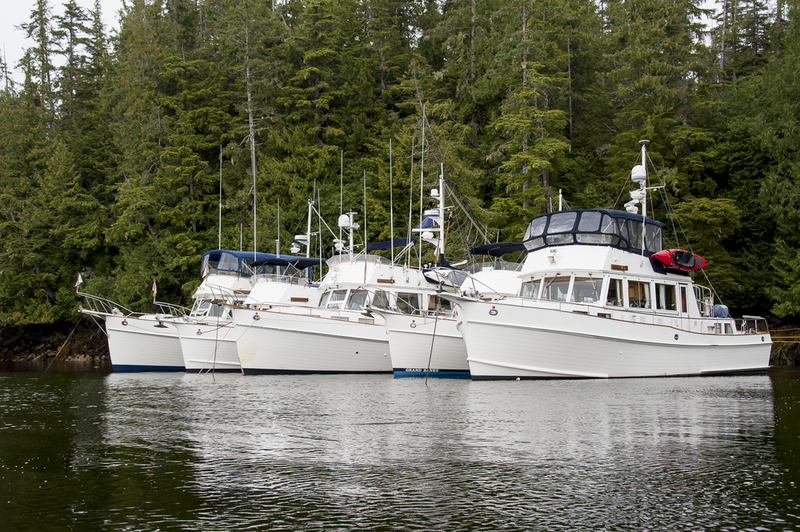 Rich and Emmelina briefed us on the next day’s travels and also what we can expect in the Haida Gwaii, two days out. Where we are going, called Gwaii Haanas (The Beautiful Islands) is an Indian reservation and protected area, so they have their rules and regulations designed to protect the lands, seas and wildlife. Not a problem and understandable, we just need to clarify what is expected from us in our travels. More on this as we get closer to the islands. The fleet has a 5:30am departure time tomorrow so by 8:30 I was asleep.